Children of service members often become invisible in the constant worry and stress of deployments, injuries, and the uncertainty of military life. Giving them special one-on-one time with their loved one is priceless. The National Military Family Association (NMFA), a nonprofit that works to strengthen military families, is accepting applications for children, ages 5 to 8, to attend Operation Purple™ Buddy Camp in Williamsburg, Virginia this summer. 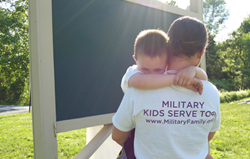 Buddy Camp is a free weekend-long program that celebrates younger, military-connected children through one-on-one bonding with their adult “buddy.” It’s an extension of NMFA’s Operation Purple™ Program, a free weeklong sleepaway camp for military kids that was started in 2004. Department of Defense (DoD) demographic reports show 68% of military children are under age 11 and 38% are under age 6—too young for the traditional camp experience. Buddy camps are an opportunity for family members to celebrate their military service together, alongside other kids and “buddies” going through the same challenges. Launched in 2017, the first Buddy Camp hosted 50 military children, along with their mom, dad, or caregiver. Zianni, a first grader, and her mom Silvia, attended Buddy Camp in November. Living with a wounded veteran and other children makes it difficult for Zianni and her mom to enjoy some of the fun parts of childhood. The Williamsburg, Virginia Buddy Camp will be held July 27-29, 2018 on the shores of the James River and will include activities like canoeing, kayaking, fishing, arts and crafts, archery, field sports, and a challenge adventure course. Military kids have a blast spending time with other children who know what it’s like to have a parent or guardian in the military—all while learning coping and resiliency skills they can use at home. Operation Purple Buddy Camp is open to ALL military kids from the Army, Navy, Marine Corps, Coast Guard, and Air Force, both active duty and reserve component, as well as families of the Commissioned Corps of the US Public Health Service and the National Oceanic and Atmospheric Administration. NMFA is accepting applications until July 3. Apply online at http://www.militaryfamily.org/buddycamp.